Terracotta Gardens is a beautiful holiday house and extensive garden in "Romantic Russell", centre of the lovely Bay of Islands, New Zealand. The house has two levels connected by an elevator, each with their own private, very large outdoor deck and spacious lounge and living area. There are three upper double bedrooms and one lower bedroom with private ensuite and spa deck. Fully-equipped kitchen/dining, lounges, bedrooms and bathrooms. The lower level has a separate kitchenette with microwave oven, mini-fridge and small stove-top. Broadband internet access via Wifi is available. Terracotta Gardens is on the hillside above the township with a view west across the Bay towards Waitangi and north across a bushclad valley where morepork and kiwi call at night and weka and tui during the day. A path descends the slope through beautiful gardens to Long Beach road where it is a five-minute walk either into the main township, ferry whart and foreshore or over the saddle to the excellent swimming beach and spectacular view of the Bay and outer islands at Long Beach. Road access to the house is from Oneroa Road opposite the Pomare Road intersection. A stroll down Pomare Road brings you to Matauwhi Bay and the yacht club while Oneroa Road extends along the ridgeline and gives alternative walks to Long Beach, the township and to Matauwhi Bay. Smoking allowed outside only. Pets by arrangement when booking. We are semi retired with several interests in Russell - an art gallery, a landscaping business, this holiday home and land and horses out the back road. I am also still a director of a computer business in Auckland that was my professional career after training as a scientist. We bought this property next to our home when it got too much for our elderly neighbour. We extended and completely renovated the house with an architect friend to make it a beautiful and practical holiday house. We landscaped the two gardens together to give each property privacy while able to enjoy the benefits of the whole space. The house is ideal for extended families with its two self-sufficient levels connected by a lift. You can have peace and privacy in your own space or join together with plenty of space to share meals, relaxation or fun. There is a huge upper deck with both sun and shade and great views for entertaining, kids to play on or dogs to enjoy. Children love the lift and everyone enjoys the hot tub spa on a rainy day, after a tiring trip or just to relax before bedtime. Fishing, charter boat and sightseeing trips depart Russell wharf. There are three swimming beaches - Long Beach, Russell and Tapeka. The last two have boat launch ramps. Lots of fishing spots. There are many coastal and bush walks nearby from a few minutes to several days duration. Russell village is a short walk (500m) or drive, well-equipped for tourists and visitors - cafes and restaurants, a hotel, tavern, groceries, hardware, pharmacy, medical centre, travel, museum, boats. House looks over the bush clad valley with a small view to the Russell village and bay. There are internal telephones on both levels and local calls are free. There is a clothes dryer in the lower level laundry and a clothes line under the covered deck on the lower level. Additional parking is available on the roadside above our two adjacent properties. There is a large two-car carport with a covered entrance to the front door. Both levels have large living rooms with couches and chairs as well as board games. There is a dishwasher in the upper level kitchen. There are two large fridge/freezers in the upper level kitchen and a small under bench refrigerator in the lower level kitchenette. There is a four element gas cooker on the upper level and a two element portable electric cooker on the lower level. There is a full underbench fan oven in the upper level kitchen. There are microwave ovens in the kitchen and kitchenette. There are plunger coffee makers and electric jugs in the kitchen and kitchenette. There are toasters in both kitchen and kitchenette. There is a full set of crockery, glassware, pans and cutlery in the upper kitchen and a smaller set in the lower kitchenette. There is a fully equipped kitchen on the upper level and a kitchenette on the lower level. There is a filtered water tap in the kitchen. There is a 4 burner gas barbecue on the upper deck. The upper level has a large dining table that sits eight. There are also outside tables, chairs and benches on the deck. There is Sky TV with sport channels. Both upper and lower levels can access it but only the same programme on both. Both levels have DVD players attached to the TV. Bookshelves, books and tourist pamphlets are provided on both levels. There is shelving with indoor games on the lower level. There is a chess set and table in the upper lounge as well as cards. There is a container of toys in the children's twin bedroom on the upper level. Some DVD movies are provided. There is a very large beautiful landscaped garden on multiple levels above and below the house with steps running right down to Long Beach Road below the property. The steps can be lit at night. Electric bicycles can be hired in Russell village. Small boats and yachts can be hired on the foreshore at Russell and Paihia. Many fishing and sightseeing charters and trips depart from Russell wharf. There is a huge enclosed upper deck partly covered with lovely views across the valley and a small view into the Bay. There is a smaller enclosed lower deck containing the hot tub and a long patio. There is a golf course at Waitangi across the Bay. The only steps (2) are from the entrance patio into the house. From the carport onto the patio can be negotiated without any steps. The internal elevator will accommodate a wheelchair. There are small lintels on the doors out to the decks but no steps. The showers are probably not suitable for wheelchairs and the toilet has only a standard door width. There is a large wooden hot tub on the lower deck which runs on timer. It is large enough for four adults and is very private, covered and sheltered but views into the garden foliage or night sky. Terracotta gardens is spacious and comfortable with lots of decks, a hot tub,/spa, a beautiful garden, loads of books, games, , puzzles, tv etc. There are full washing and drying facilities, easy access to get to Russell township or long Beach. Alan has provided everything you might need and all you need to do is move in, let food and some nice wine and enjoy! Terracotta cottage was a great spot for our Bay of Island's holiday with our adult kids. Loads of space and kitchen well appointed for the number the house accommodated. Lift was a novelty and worked well and hot tub enjoyed by all despite the hot weather. Single bed is probably better suited for a child than an adult but was advertised as a child's room. Others have commented on the musty smell downstairs which we did notice the first time we went down but as Alan suggested we opened the doors and it was gone within a few minutes. There are loads of doors (7 sets of ranch sliders) so nice and airy. Easy walk into town and nice and quiet. Would definitely recommend and stay again. 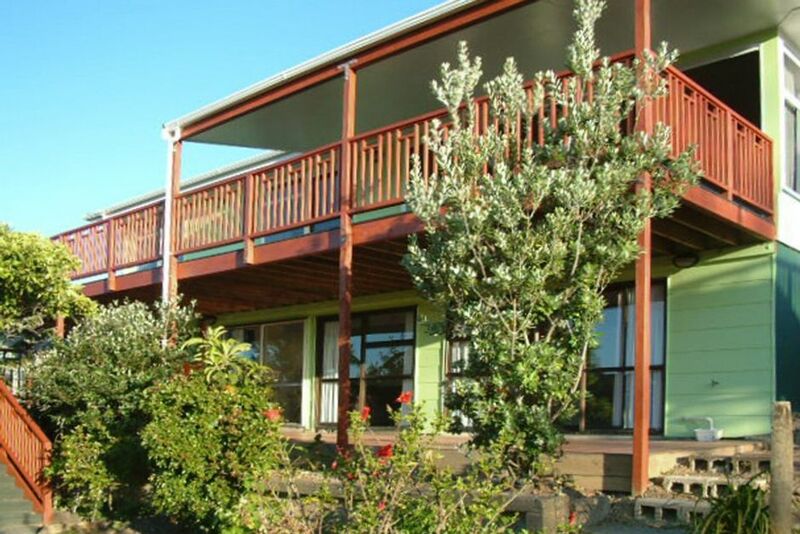 Terracotta Gardens is a lovely property with plenty room for all and very comfortable. Because it has a lift I made the mistake of thinking the property would be good for my elderly aunt who recently had a knee reconstruction, but the steep driveway is a hazard (and I was too much of a wimp to drive the low hire car down the drive.) Other than that we felt very relaxed there and thoroughly enjoyed the beautiful surroundings. Perfect location for Long Beach and Russell waterfront. Lots of space for big families, good facilities. Clean, tidy and comfortable. Russell is extremely historic, being the original destination for whalers and sealers and first settlements in New Zealand. Some of the old buildings date back to those times and you can visit the old French Catholic printery set up by Bishop Pompallier and see the whaling relics in the Russell Museum. There is a mini bus tourist trip that takes you around the area showing you a lot of the significant places to the historic events including battles between colonists and Maori. Russell is central to the whole Bay of Islands and there are many boating and fishing trips that depart from Russell wharf. Terracotta Gardens is centrally located to all the beaches and town, but far enough away to be peaceful even in the height of the tourist season. It's warm on the sunny side of the hill with a beautiful garden below to explore and glorious views from the huge upper deck. For day trips on land you can explore the Waitangi Treaty grounds across the Bay or go to Cape Reinga and Ninety Mile Beach to explore the Far North or go west to Hokianga Harbour and see the giant kauri Tane Mahuta just south of that. Closer to home is exploring Rawhiti peninsular, surfing at Elliot Bay, walking over the hill to Whangamumu harbour or exploring beautiful Whangaruru harbour via Bland Bay, Oakura or even Mimiwhangata. You can take the passenger ferry across to Paihia and enjoy their Thursday market or take the children to the amusement park there. In summer the dinner cruise up to Haruru Falls is a lovely way to spend an evening. You can also go paragliding around the bay from Paihia, take a helicopter ride, play golf at Waitangi or ride the mountain bike trail there.